This month WineCollective featured a wine from New York, a very under-represented wine region. There is only a handful of producers to be found here in Alberta. First, here is a crash-course in all things New York wine. 5 AVA’s: Long Island, Finger Lakes, Hudson River, Niagara Escarpment and Lake Erie. Long Island has been a registered AVA for 40 years. Sandy soils and moderate climate produce mostly red wines in Bordeaux style, or Meritage. 66 wineries with over 2,000 acres of vines. Finger Lakes region specializes in sparkling wines and ice wine from Pinot Noir and Riesling. 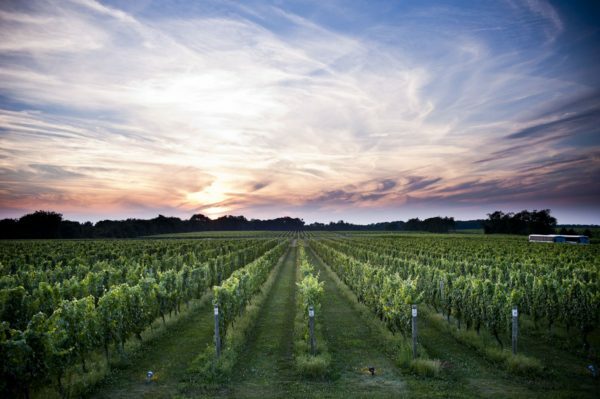 Almost double Long Island, there is 119 wineries and over 9,000 acres of vineyards. The Hudson River is the grand-dad of New York wine production. Varietals here are the vinifera and American species. Commonly found are, Seyval, Chardonnay, red blends and fruit-based wines, with just 200 acres of vines. Niagara Escarpment, only receiving AVA status in 2005, also boasts some of the warmest climate. Varying soils create unique micro-climates among the 883 acres of vineyards, from dolomitic limestone, to gravel along the lakeshore. Lake Erie is the second largest grape producer in the US, with California being first. The majority, about 95% is Concord grapes for juice production. WineCollective attended a seminar on the cooler climates of the Finger Lakes region. Here, the wines are predominately white and are similar to the varietals that you will find from Canadian wineries. From Riesling to Cabernet Franc, tonnes of character and diversity can be found in the Finger Lakes. Here is a quick way to find out what Finger Lakes wine is right for you! Is Thai take-out is on your menu at least once a week? We fell in love with the variety of Riesling we tasted, from dry to off-dry, the flavours ranged from lemon, wet stone, white cranberry, to ripe melon, lime zest, and all with mounds of acidity. There are tonnes of exemplary Rieslings to choose from, try the Boundary Breaks Clone 239 from Seneca Lake vineyards. Find yourself in the Chilean aisle of the liquor store? Brotherhood Pinot Noir is produced from the oldest winery in America, with tonnes of Chilean talent. Philip Dunsmore, Vice President, moved to New York from Chile to work at Brotherhood. Expect Burgundian style, new American oak and a brambly-smokiness. Lemberger is a German name for an Austrian grape, Blaufränkisch. Found mostly in Washington, there is about 15 producers in New York country with plantings. The Fox Run Lemberger is bountiful with black pepper, which can indicate a cooler vintage. These wines have never before been featured in WineCollective packages. Find them at member pricing today in the WineCollective online store!